What’s the top metaverse blog? Nothing gets the juices going like a little friendly competition. In updating our advertising demographics and getting our Google analytics for 2013 — we had over 125,000 unique readers! yay! 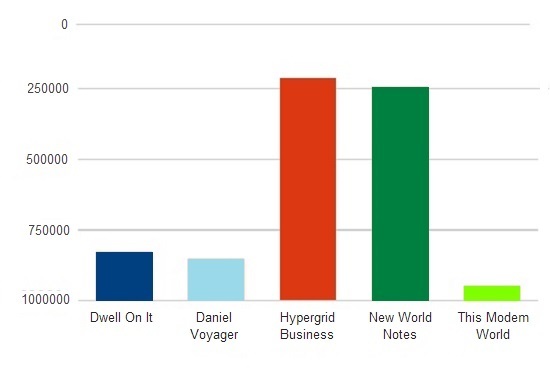 — I got curious about how Hypergrid Business stacked up against other publications that cover OpenSim and the hypergrid on a more-or-less regular basis. I ran pretty much every blog out there through Alexa, and besides us, the four top sites for OpenSim coverage are New World Notes, Daniel Voyager’s Blog, Dwell on It, and Living in a Modem World. I’m not counting the Second Life lifestyle blogs here, some of which have quite a bit of traffic but rarely, if ever, mention OpenSim. According to Alexa, we’re doing pretty well — the red line in the graph below is Hypergrid Business, and the green line we’re twisted around is New World Notes. The other three blogs are in a stiff race for third place. Here’s a closer look at the numbers from the very far end of the Alexa chart. With Alexa, the lower the number, the better. So, for example, right now Google is ranked 1, Facebook is ranked 2, and YouTube is ranked 3. Alexa rankings for top five metaverse blogs as of the end of January 2014. We’re not actually competing for readers at this point. 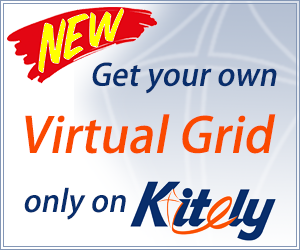 There’s so little information about OpenSim and the hypergrid available right now, that the more sources and voices, the better. I personally read all of these blogs, and those of my readers who haven’t visited them yet to check them out. And we all have slightly different areas of coverage, approaches, and opinions as well. So even if we sometimes do cover the same story, we do it from different perspectives. There is a new competitor to Alexa rankings, called SimilarWeb, which shows New World Notes doing substantially better. The blue line is New World Notes, the orange line is Hypergrid Business. Oh, the horror. We’re being pummeled. However, it seems to be counting only half of Hypergrid Business traffic as reported by Google Analytics. Now, if SimilarWeb is also undercounting New World Notes traffic the way that they’re undercounting ours, then New World Notes is doing extremely well. Kudos! Or maybe they’re still getting the kinks out of the system, since they just launched, and Alexa has been around for a while. I’ll be keeping an eye on both these metric sites, just in case.